The technology of today including social media has drastically changed the way we communicate. Back when I was a teen, the Internet wasn’t really “a thing” and there was no such thing as social media. If you wanted to talk to someone, you either called them on the telephone or stopped by their house to see them. Nowadays, you can text them, email them, Facebook them to name a few of the different ways you can stay in touch with someone without ever actually seeing them face-to-face. In a way, it’s good because you can stay in touch with people you probably never would have spoken to ever again. For instance, I still talk to people I knew in high school on Facebook. 20 years ago, this wasn’t possible. There is a downside though. We are missing out on the human connection. Have you heard of the Cheerios Effect? It’s a real scientific principle that was named after the cereal. When you drop two Cheerios in a bowl, they’ll eventually float together and connect. Try it next time you are eating breakfast. I eat Cheerios often and have noticed this effect, but never gave it much thought before. As people, we naturally want to connect with others. It feels good, makes us happy and provides us with a feeling of comfort. I sat down and reflected on my own life and have many meaningful personal connection stories to share. The one that I’m sharing today is the story of me and my younger sister, Laura. As kids, we fought like cats and dogs.Our fights were very physical with lots of hair pulling, scratching and even biting. I have the scars to prove it! The words “I hate you” were thrown around often. My whole family was sick of our constant bickering. I was glad to move out at 19 to go to school and leave the drama behind. Fast forward to a few years later. I was married and a mom and my sister was finishing up her university degree. I’m not sure what happened or even how it happened, but our relationship seemed different. Gone were the childish arguments, name calling and negative attitudes and in its place was peace, understanding and even love. I chalk the change to the act of “growing up”. We got over ourselves and were able to become close like sisters should be. Now that I’m living in my hometown, I see my sister on a regular basis. We text and Facebook message, but we also get together in real life! We’ve had many family dinners, played board games and even busted a few dance moves in my parent’s living room. We connect and it is wonderful. To me, that is the Cheerios Effect. Watch this video of two cousins who grew up as sisters and see the soul connection they have. It reminded me a little of my relationship with my sister today. Do you have your own story of personal connection? 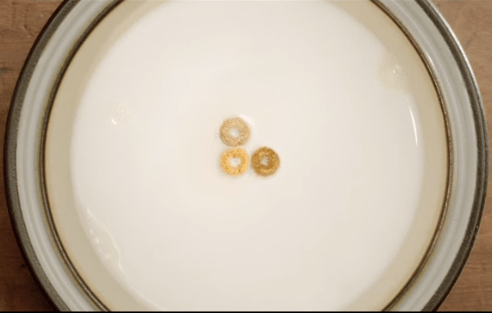 Bring it to life with a video that showcases the Cheerios Effect in action. Don’t worry – you don’t need any technical skills to do one. Just share your story in 300 words and under and Cheerios will do the rest. I made one about me and my sister. Check it out. What is your connection story? Whenever I go back to my hometown to visit the cheerios effect happens. We all say cheerio!